← Went to Wyrley, started early. I felt that I had mildly special reasons to be excited about Terry Herbert’s discovery of The Staffordshire Hoard on Fred Johnson’s land in the summer of 2009. It fired my imagination to think that numbers of my family might well have crossed those very fields for generations, oblivious to the glowing garnet and gold treasure beneath the stride of their working boots. And all that talk of shields and sword pommels adorned with cloisonne and filigree brought back memories of hedonistic, full grant, London University days. It was during the spring of 1983 that I made a futile attempt to compensate for my dedicated and thoroughly reprehensible time-wasting during the preceding 27 months. The core of the course was English Literature, up to 1880. For my “special subject”, inspired by mesmerising fragments of Anglo Saxon poetry, I made the maverick choice of Anglo Saxon Archaeology. The course was conducted in Bloomsbury, necessitating a weekly, teatime, bicycle-train-bicycle dash from my campus in leafy Surrey. I was an indolent and distracted student, but it was well worth the effort of the journey to listen to Vera Evison, who illustrated her lectures with grainy slide projections. These showed a still recognisable Miss Evison, all tweed skirts and brown brogues, offering up to the camera some small but significant bits of glass and metal from the depths of a sepia tinted trench in the 1920s and 30s. I was entranced by the experience, deeply impressed by the outfits, and fascinated by archaeology, but had hardly taken in any facts. Fortified by pork pie, and swilling Courage Directors’, I scoured past exam papers for hints and clues and cheats which might, hope beyond hope, assist me in my finals. 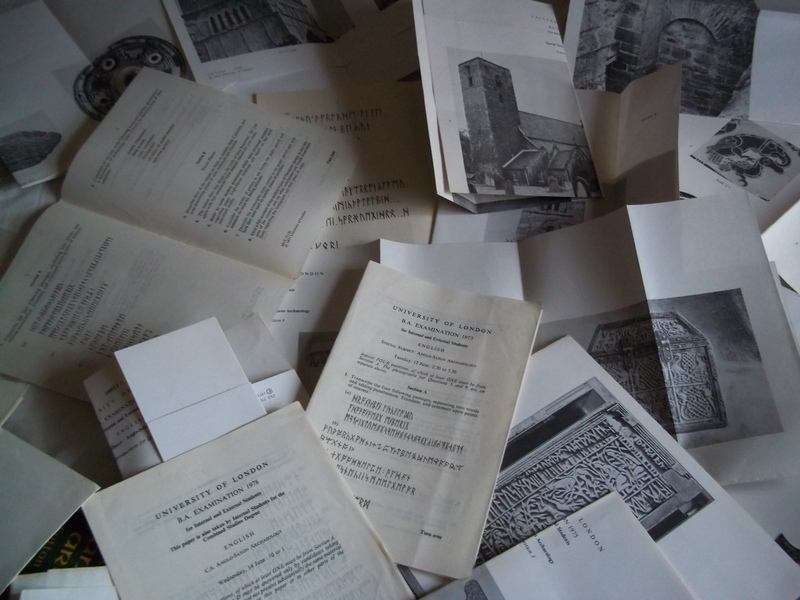 The Anglo Saxon examination was to include a “picture round” detailed on a large, glossy, black and white, pull-out page. 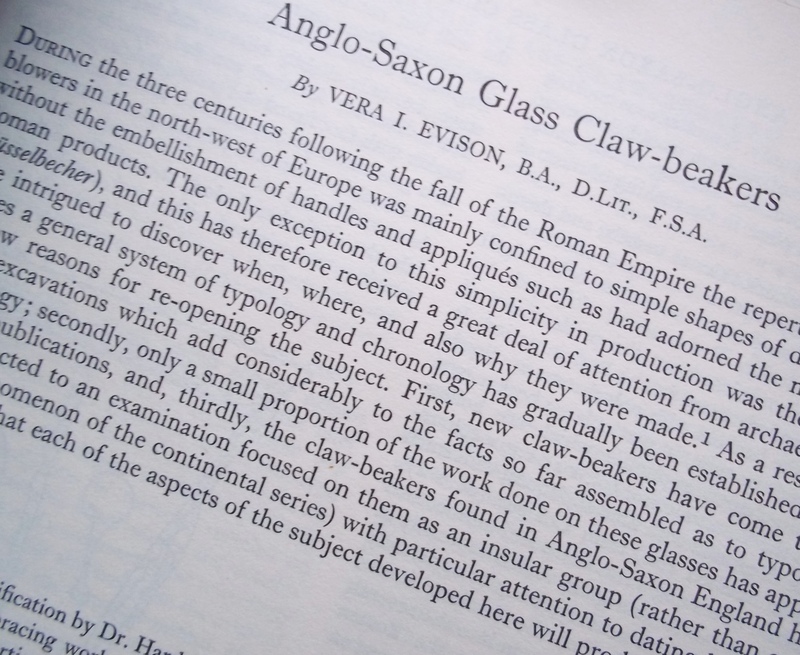 Artifacts from the Sutton Hoo ship burial, excavated in 1939, predominate on the 1970s papers. A few Saxon church towers, and the unprepossessingly rusty looking “Benty Grange Helmet”, found way back in the 19th century, appear repeatedly. Each year a different one of the five decorated faces of the “Franks’ Casket” was given an outing. The inscriptions on that were also a handy resource for those setting tests in runic translation. The casket was made around the 8th century out of whale bone, but was cavalierly being used by a French household as a sewing box until shortly before Augustus Wollaston Franks bought most of its sorry remains in a Parisian antique shop in 1857. They were all old news, these finds, and not very numerous. But that was before what we like to call The Brownhills Hoard. Setting exam questions must be much more interesting these days. You really can’t imagine how all that lustrous gold, thrust roughly into the ground near the Watling Street escaped notice for so long, especially now that we know that the hoard was scattered by ploughing activity. Once “detected” and dug up, though, it would have been impossible not to notice that you were holding precious things in your hands. So, I think that huge credit should be given to a young girl who, in 1954 Lynn, in the “Big Field” of Owletts Hall Farm, noticed a smooth, dull, stone protruding from a post-hole which she had been digging to position a horse-jump, and instantly recognised it as an archaeological find. Lichfield Museum Services were less than interested, but the “Friary” schoolgirl was happy to exchange it for a fat Postal Order from Birmingham Museum. 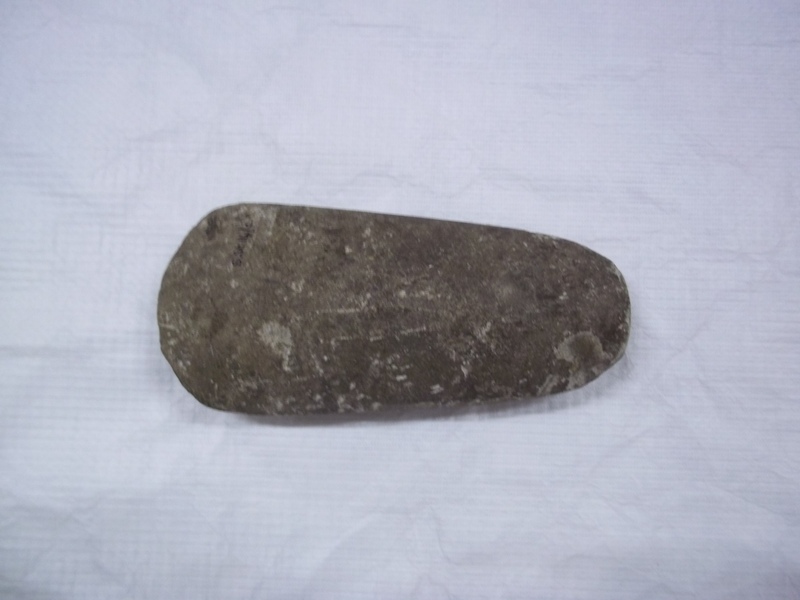 According to “Discovering Stonnall”, produced by the Lynn and Stonnall Conservation and Historical Society, my cousin Rosalind had discovered the only Neolithic axe that has so far come to light in the parish of Stonnall. This is a little disingenuous of them, since, when I paid Ros’s axe a visit recently at the Museum’s fantastic storage facility, it was nestling companionably in a drawer with some other Neolithic axes from very closely adjacent Shenstone. These were finds by Mr Charles Foden who, luckily for we interested parties, made a habit of following his ploughman to see what might turn up on the land of Shenstone Hall Farm. He made donations to Roman as well as prehistoric collections. We pulled up at Birmingham Museums’ secret, extra building on a bright winter’s morning. We have been in a fair few warehouses over the years, foodstuffs, car parts, workaday and boring. 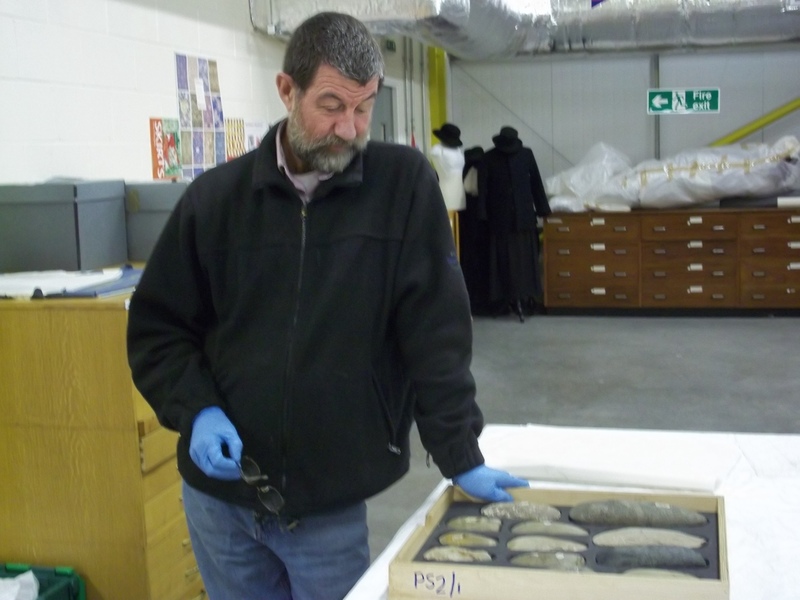 This visit, however, was an unforgettable and surprisingly emotional experience, following Collections Manager, Phil Watson through the serried rows of archived exhibits, to the drawer which holds our axe. Ken and I made slow progress down the aisles, looking from from side to side and back again, in something approaching awe. A Dali-esque array of ships’ figureheads, perambulators, engines, stuffed birds and framed embroideries seemed to be bursting forth from the racking, but, within some arcane cataloguing system, all was in absolutely perfect order, and solicitously protected by fire suppression systems and parasite traps. Phil Watson allowed himself a wry smile at the looks on our faces – he says he is quite used to visitors to this establishment being quite overwhelmed by it. Here is the object. An axe. A tool for felling trees. Ken has a fearsome collection of metal bladed axes at home – weapons used daily in the constant battle to feed our greedy Rayburn. He could only imagine this stone axe wielded day-long until it achieved the pulverisation of bark and wood. Not what you would describe as “cutting”. But without recourse to metal tools, this beautiful object would achieve exponentially more than bare hands. The stone is from Charnwood Forest, I learned. This tangible evidence now enables me to contemplate our ancestors – many, many generations ago in what is now called Staffordshire, trading stone along an ancient track, shaping and polishing stone with a high degree of skill, and clearing the deeply forested land to farm it for food. I admired another object in the drawer: mossy-green, mottled, highly polished, right beside the Owletts Axe. Within such a small sample, it was startling to see that the location of its discovery was Orgreave, where we live. Its asymmetrical appearance is due to its sharp edge having been repolished following use. Phil Watson had showed us larger scale examples of these tools which would have been impractical in use, had not been worn, and could be surmised to be ceremonial objects, serving as status symbols, or even currency. He took us to a nearby cabinet, and removed a knapped flint tool over a hundred times older than than the others. This, I was allowed to hold. Ergonomic is the word. My hand folded around it, an exact fit. My thumb found a perfectly placed depression to assist me to grasp it. Objects with the patina of 50 years handling can excite me. To touch this 500,000 year old object was overwhelming. There were tears! Fascinating, I am so enjoying reading your stuff. Thanks, Ann. It is so lovely to get feedback on what I post! Nice one, would love to know the story behind that find in Hammerwich! looks like i will have to build a time machine, with two seats, one for myself and one for you. I’ve been trying to find a video I saw the other day comparing a hand-axe like that one to a computer mouse – certainly comparable in size and shape, because both fitted to the human hand. No luck so far – but this is all fascinating stuff. This is a wonderful blog. Thought you may wish to know that The Hoard survived for so long because it was buried under a small hillock, which was only removed in the 1970s, also archaeologists are calling it the Ogley Hay Hoard. Thank you. That indeed is a revealing fact…. I do appreciate the positive feedback, I really do.